افندی‌زاده, شهریار, توکلی کاشانی, علی, تقی‌زاده, یاسر. (1396). شناسایی مکان‌های پرتصادف جاده‌ای با استفاده از روش تلفیقی تحلیل پوششی داده‌ها و تحلیل سلسله مراتبی (AHP/DEA). پژوهشنامه حمل و نقل, 14(4), 33-45. شهریار افندی‌زاده; علی توکلی کاشانی; یاسر تقی‌زاده. "شناسایی مکان‌های پرتصادف جاده‌ای با استفاده از روش تلفیقی تحلیل پوششی داده‌ها و تحلیل سلسله مراتبی (AHP/DEA)". پژوهشنامه حمل و نقل, 14, 4, 1396, 33-45. افندی‌زاده, شهریار, توکلی کاشانی, علی, تقی‌زاده, یاسر. (1396). 'شناسایی مکان‌های پرتصادف جاده‌ای با استفاده از روش تلفیقی تحلیل پوششی داده‌ها و تحلیل سلسله مراتبی (AHP/DEA)', پژوهشنامه حمل و نقل, 14(4), pp. 33-45. افندی‌زاده, شهریار, توکلی کاشانی, علی, تقی‌زاده, یاسر. شناسایی مکان‌های پرتصادف جاده‌ای با استفاده از روش تلفیقی تحلیل پوششی داده‌ها و تحلیل سلسله مراتبی (AHP/DEA). پژوهشنامه حمل و نقل, 1396; 14(4): 33-45. شناسایی مکان­های پرتصادف و ایمن‌سازی آنها، از موضوعات بسیار مهم در مباحث ایمنی ترافیک است. تاکنون روش‌های گوناگونی در رابطه با این موضوع به کار گرفته شده است. در این مقاله از روش تلفیقی تحلیل پوششی داده‌ها و تحلیل سلسله مراتبی (AHP/DEA) به عنوان یکروش جدید برای شناسایی مکان‌های پرتصادف بهره گرفته شده که تا به حال در این زمینه استفاده نشده است. ضعف روش AHP این است که نیاز به وزن‌دهی کارشناسی دارد و مهمترین ضعف روش DEA این است که قادر به اولویت‌بندی واحد‌های کارا نیست. اما با ترکیب این دو روش و استفاده از روش AHP/DEA در این مقاله، کاستی‌های هر دو روش مرتفع شده است. متدولوژی این مطالعه بر روی داده­های 51 قطعه راه دوخطه دوطرفه برون‌شهری پیاده‌سازی شده است. نتایج حاصل از این بررسی با نتایج سایر روش‌های شناسایی مکان‌های پرتصادف، به ویژه روش DEA که قبلاً به کار گرفته شده است، مقایسه شد. این مقایسه علاوه بر تایید صحت نتایج حاصل از متدولوژی این مطالعه، قدرت روش AHP/DEA در شناسایی مکان‌های پرتصادف را نشان داد. 2Assistant Professor, School of Civil Engineering, Iran University of Science and Technology, Tehran, Iran. 3Ph.D. Student, School of Civil Engineering, Iran University of Science and Technology, Tehran, Iran. Black spot identification is one of the major issues in the context of traffic safety. So far, various methods have been used in relation to this matter. In this study, we use a hybrid method of data envelopment analysis and analytic hierarchy process (AHP/DEA) as a suitable method to identify black spot location that which was not used previously in this context. AHP method has the disadvantage that it requires expert weighting and the main weakness of DEA is inability to prioritize decision units. Therefore, combining these two methods in this paper we have tried to overcome the weaknesses of both approaches. The presented methodology in this study was applied on the 51 sections of two-lane two-way rural roads. The results of our methodology were compared with results of other methods of identifying black spot locations. These comparisons verify the results of our work and show the power of AHP/DEA in identifying black spot locations. -حبیبی­نیا، ق.، (1390)، "رویکردهای تلفیقی تحلیل پوششی داده‌ها و فرآیند تحلیل سلسله مراتبی"، پایان‌نامه کارشناسی ارشد، دانشکده ریاضی، دانشگاه علم و صنعت ایران. -رصافی، الف.، و مومنی، ف.، و آسترکی، ز.، و امینی، ب.، (1391)، " کاربرد تصمیم گیری چند معیاره در شناسایی نقاط پرحادثه: استفاده از روشهای تحلیل پوششی داده­ها و تحلیل همایی"، فصلنامه مهندسی حمل و نقل. -صادقی، ع. الف. 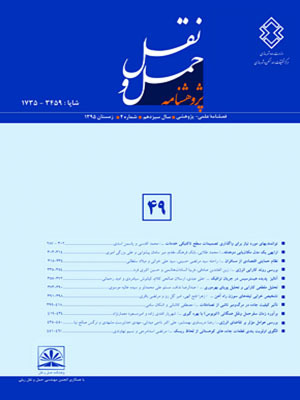 و آیتی، الف.، (1391)، "شناسایی و اولویت بندی قطعات حادثه خیز راه با رویکرد قطعه بندی مسیر و تحلیل پوششی داده‌ها. مهندسی حمل‌ونقل. -Agent, K. R. (1973), "Evaluation of the High-Accident Location Spot-Improvement Program in Kentuck". -Association, W. R. (2003), "Road safety manual: recommendations from the World Road Association", (PIARC), Route2 Market. -Charnes, A. (1994), "Data envelopment analysis: theory, methodology and applications", Springer. -Charnes, A., Cooper, W. and Rhodes, E. (1978), "Measuring the efficiency of decision making units", European journal of operational research, Vol. 2, No.6, pp. 429-444. -Cheng, W. and S. P. Washington (2005), "Experimental evaluation of hotspot identification methods" Accident Analysis & Prevention, Vol.37, No.5, pp. 870-881. -Elvik, R. (2003), "A survey of operational definitions of hazardous road locations in some European countries”, Accident Analysis & Prevention, Vol. 40, No.6, pp. 1830-1835. -GEURTS, K. and G. WETS (2003), "Black spot analysis methods: literature review. -Hauer, E. (1997), "Observational Before/After Studies in Road Safety, Estimating the Effect of Highway and Traffic Engineering Measures on Road Safety. -Hermans, E., Brijs, T., Wets, G. and Vanhoof, K. (2009), "Benchmarking road safety: lessons to learn from a data envelopment analysis”, Accident Analysis & Prevention, Vol. 41, No.1, pp. 174-182. -McGuigan, D. (1981), "The use of relationships between road accidents and traffic flow in" black-spot" identification" , Traffic Engineering & Control, Vol. 22, HS-032 669. -Miranda-Moreno, L., Fu, L., Saccomanno, F, and Labbe, A., (2005) "Alternative risk models for ranking locations for safety improvement", Transportation Research Record: Journal of the Transportation Research Board, Vol.1, pp. 1-8. -Pawlovich, M. D. (2002), "Safety Improvement Candidate Location (SICL), Methods", Iowa Department of Transportation, Highway Division, Engineering Bureau, Office of Traffic Safety. -Persaud, B., Lyon, C, and Nguyen, T., (1999), "Empirical Bayes procedure for ranking sites for safety investigation by potential for safety improvement", Transportation Research Record: Journal of the Transportation Research Board, Vol. 1665, No. 1, pp. 7-12. -Sinuany‐Stern, Z., Mehrez, A, and Hadad, Y., (2000), "An AHP/DEA methodology for ranking decision making units", International Transactions in Operational Research, Vol. 7, No. 2, pp.109-124. -Van Raemdonck, K. and C. Macharis (2013), "The road accident analyzer: a tool to identify high risk road locations"­, Journal of Transportation Safety & Security (just-accepted). -Vistisen, D., Thyregod, P, and Laursen, J. G., (2002), "Models and methods for hot spot safety work", Technical University of Denmark Denmark’s Tekniske University, Administration, Office for Study Programs and Student Affairs.